Despite their distinctive appearance, the salvinias are floating aquatic ferns. The leaves are usually rough and arranged on either side of a floating horizontal axis. They reproduce by means of runners, and can rapidly invade a tank, although they are sensitive to drops of condensation falling from the lid. 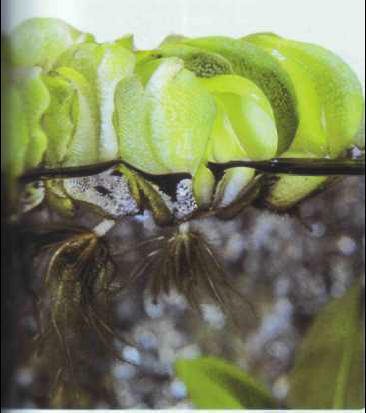 The floating leaves of the salvinia are more than 1 cm long, which distinguishes it from the closely related, and otherwise biologically identical, S. minima. If the lighting is good, it grows quickly in neutral, soft water. It is recommended as a haven for fry in rearing tanks. Size of a floating leaf: 2 cm. ЮВЕНИЛЬНЫЙ ГОРМОН насекомых , вырабатывается железами - прилежащими телами. Совместно с экдизоном и другими гормонами регулирует метаморфоз, обеспечивая нормальное протекание линек на стадии личинки. По химической природе - изопреноид. Синтетические аналоги ювенильного гормона используются в качестве инсектицидов.